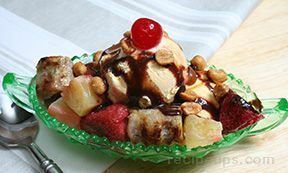 Kids (and probably most adults) will love this scrumptious adaptation of the popular banana split ice cream treat. Top it any way you like, but mini chocolate chips seem to go so well with the peanut butter. Microwave peanut butter in a microwave safe dish on high for 45 to 60 seconds or until it is melted. Slice a v-shape wedge from each banana, down the length of the banana so that it looks like a canoe. Reserve the wedge of banana for the topping. Dish two scoops of vanilla icecream into each serving dish. 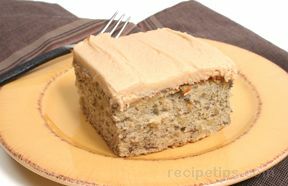 Slice each scoop in half and nestle the banana into the slice. 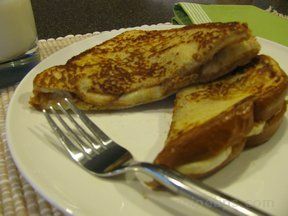 Pour the peanut butter down the center of each banana. 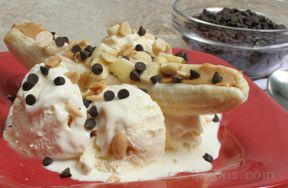 Top with mini chocolate chips, peanuts and chopped reserved pieces of banana. Note: For a healthier variation, top with raisins instead of chocolate chips and use frozen yogurt in place of the ice cream.